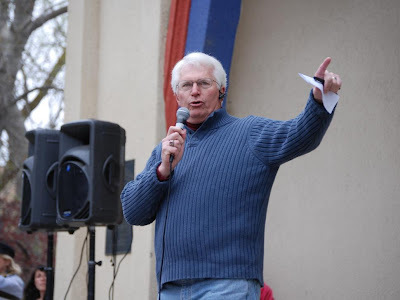 Bryan Fischer, formerly a pastor in Boise, ID and currently working with the American Family Association had some critical comments of Sea World after one of their trainers was killed during a rare accident with a killer whale. Dawn Brancheau, a 40-year-old trainer with 16 years of experience at the park tragically drowned in an incident involving the trained killer whale, Tilikum (Tilly). SeaWorld is apparently, however, unrepentant. Chuck Thompson, its curator in charge of animal behavior, says Tilly continues to be "a valuable asset not only from a breeding standpoint but from a behavior standpoint, too." Chuck might want to ask Dawn's Mom what she thinks about that. Thompson did add, helpfully, "I think we need to evaluate his behavior and everything that's happened up to this point." You're about 19 years too late, Chuck, and the blood of Dawn Brancheau is on your hands. So what do you want us to do, Bryan, sue Sea World or stone Chuck Thompson and his whale? How are we really supposed to take counsel on this practical matter from Scripture? Didn’t you just say we are in this situation because we weren’t following the biblical rules? Why draw the line now? You stated that Thompson had blood on his hands. What do you think you were implying? Fischer, loving the publicity, but not wanting to be seen as madman, clarified in a second blog article that he didn’t think the whale should be stoned, but humanely euthanized without using rocks. He also tries to dodge his earlier retribution suggestions. Actually, no it won’t Bryan. My unhinged bloviating is coming now, especially in light of your closing statement. If you think your unhinged Bible-study has been a helpful addition to Biblical literacy, I disagree. If you think people look at Christianity differently after your statements hit the news, they probably do, but unfortunately not in a helpful way. Can I suggest you reread the passage where an adulterous woman was dragged before Jesus because by OT standards she should be publically stoned? Do you remember what Jesus did instead of picking up a rock? Do you think what he wrote in the sand might apply to your understanding of scripture. It sure impacted the religious scholars that day. You should follow their lead and silently slip away. What amazes me is that this is the first time Bryan's made it on JOS. Brandon, there, and I had plenty of JOS moments in the office when Bryan's e-mails would come in each week.